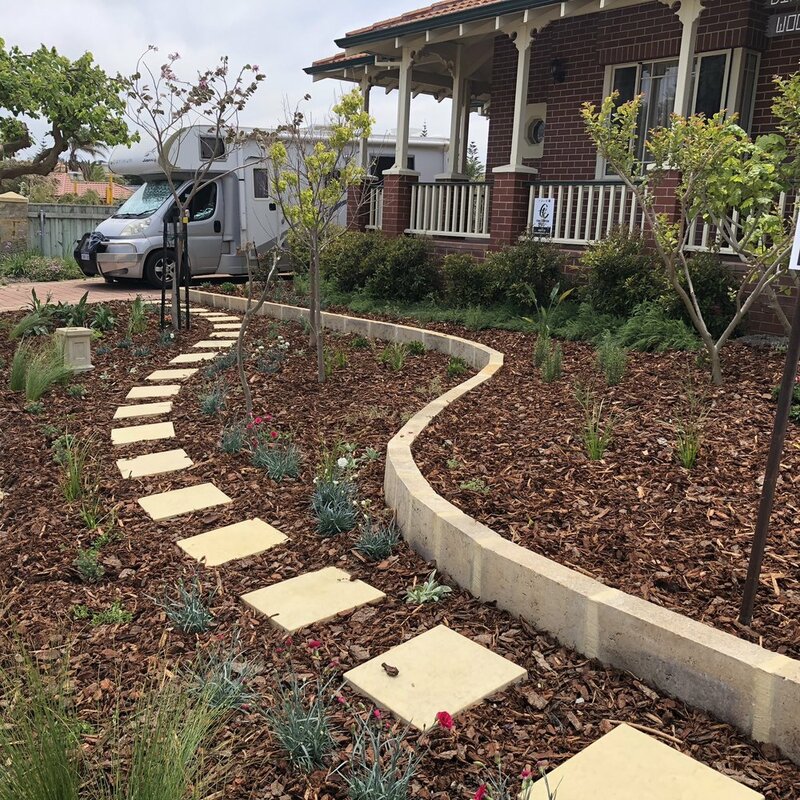 This compact front garden is a tough site for plants – it is second line coastal, subject to salt-laden winds, full western sun and comprises alkaline limestone sands. The client brief was for a colourful, flower-rich, hardy garden to replace the high-maintenance lawn. I drew upon the myriad of Mediterranean plants and some native species to create a plant palette that was not only hardy and well suited to the site conditions, but that would indeed thrive in the impoverished "soil" and heat of a Perth summer. After removing the lawn, being careful to preserve the roots of the existing trees, the ground was treated with soil wetter and seaweed tonic, before being covered with a generous layer of coarse bark mulch. While this will settle over time, the deep layer will insulate the ground and reduce water loss while the large spaces will still allow rainfall to penetrate. In-line dripper irrigation below the mulch layer is connected to a rainwater tank to provide deep, infrequent irrigation if required. Plants used include Dianthus ‘Memories’ & D. ‘Waterloo Sunset’, Buddleja davidii ‘Buzz Velvet’, Rosemarinus officinalis ‘Portugese Pink’, Ceanothus ‘Blue Cushion’, Strelitzia reginae, Scaevola ‘Purple Fusion’, Lomandra longifolia ‘Tanika’, Ficinia nodosa, Alstromeria ‘Paola’, Stachsy byzantina, Cyclamen persicum, Rhaphiolepis x ‘Oriental Pearl’, Lavandula angustifolia ‘Miss Donnington’, Echium candicans, Cistus x skanbergii, Nepeta racemosa ‘Walkers Low’, Westringia fruticosa ‘Grey Box’, Arthropodium cirrhatum ‘Te Puna’, Thymus praecox ssp. brittanicus, Stipa gigantea and Limonium perezii. Three months after planting this garden is beginning to establish. Despite a couple of heatwaves before Christmas it is proving hardy and tolerant of the conditions.